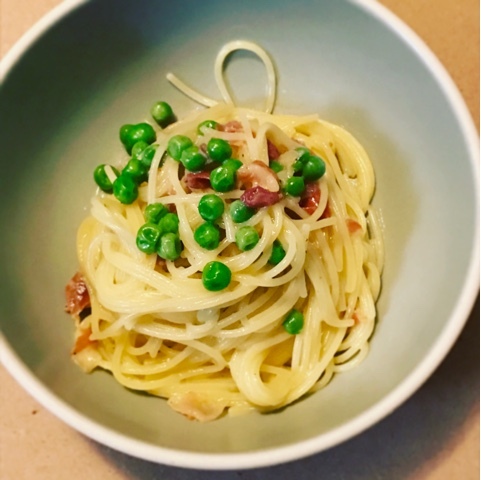 Carbonara is one of my husband's favorite pasta dishes, and since we had extra prosciutto and Parmesan after our recent Italian breakfast, it made for a perfect easy dinner. Although prosciutto isn't the most common pork product you see in carbonara recipes, it ended up working really well -- the flavor is amazing and it got nicely crisp in a little hot oil on the stove top. The key to a creamy sauce (instead of scrambled eggs) is just to work quickly as you toss the hot noodles into the raw egg-and-cheese sauce. Make sure to save some of the cooking water from the pasta -- you can add it a little at a time if the pasta looks too dry. Bring a large pot of water to a boil and season with a little salt. When it boils, add the pasta and cook until al dente. Reserve a cup of the pasta water before draining. While the pasta water boils, heat the olive oil in a skillet until shimmering. Add the prosciutto and cook, stirring often, until it starts to get a little crispy. Add the peas, stir to combine, and keep warm on very low heat. In a large bowl, whisk together the egg yolks, whole egg, Parmigiano Reggiano, and pepper. Drain the pasta, and immediately transfer it to the bowl with the egg-cheese mixture. Working quickly, toss everything together with tongs. Add some of the reserved pasta water as needed to make a creamy sauce. Stir in the prosciutto-pea mixture, taste, and adjust for seasoning. Serve hot.